Pulse Glass started in a garage in Southern California with a vision to create top quality, hand blown, glass products that feature a fusion of classic and scientific designs, which highlights the clarity, quality, and function of the product. The Pulse Glass family loves doing things that give back to their customers, the industry, and the environment and community. Being successful in business is one thing. Using your success as a tool to help positively impact the world is another. 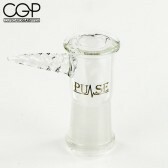 The Pulse Glass family strive to do both because they believe that happiness never decreases by sharing and they want to share the happiness that they have from the opportunity to create their products for you.